If you’ve ever been the victim of a hacker, you know how devastating it can be. According to Google’s security team, passwords are just not sufficient protection for today’s citizens of the web. They say that the future of internet security lies in devices like the one above. 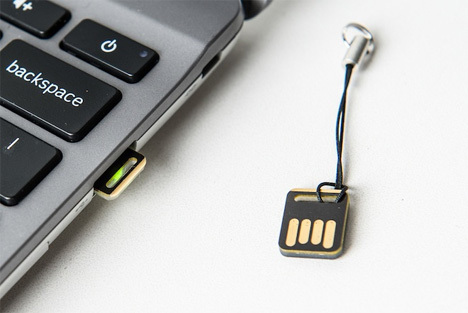 Yubico makes a line of small USB cryptographic cards; in short, they’re like car keys and they’re small enough to fit on your key ring like actual keys. Rather than punching in passwords for every website, in the future we’ll all simply plug our USB “keys” in to start surfing. But internet security in the near future might be even simpler than that. In their paper on the subject, the Google team indicated that security devices might take the form of a ring worn on the finger. A simple tap on the computer with the be-ringed finger would be all that is needed to authenticate a user. 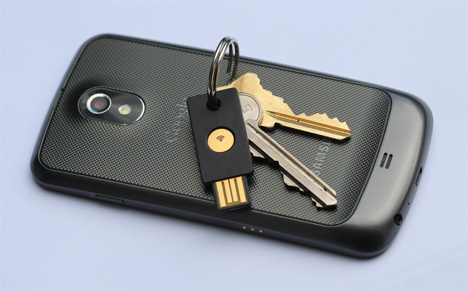 Another option involves a user’s smartphone acting as a wireless authentication device. As of now, Google is working on building a protocol that will allow users to authenticate via a device, but until plenty more websites and software companies get on board with the new standard, we’re stuck remembering passwords and typing them in over and over. See more in Unbuilt Concepts or under Technology. January, 2013.